We are pleased to present Premier Services for Architect designed Residences/ Estates that will enable you to realize the home of your dreams -- in any size, scope, or style. Luxury real estate or starter residential plans and elevations are custom crafted -- according to your vision and specifications -- in Classical or Contemporary Period Styles, planned for a current use or future site. 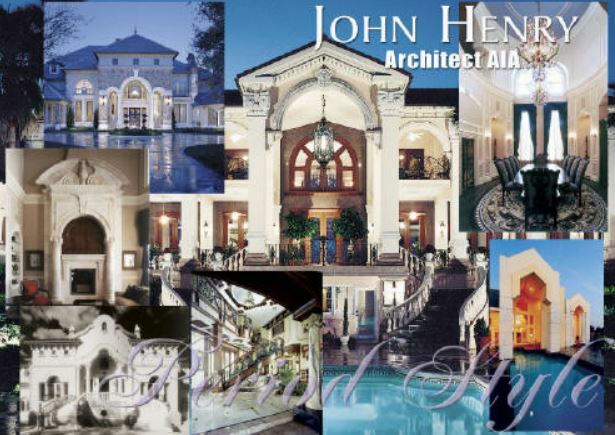 John Henry Architect, AIA NCARB is eminently qualified to assist the Owner in the planning and conception of the Custom Residence and to direct every critical aspect of the design/ construction process in order to preserve the integrity of the design and thus investment value in censi-bouvard LMNP. Mr. Henry offers professional design services nationally and worldwide, supported by a comprehensive architectural background and experience in varying styles and sites. Our specialty is luxury custom Traditional period homes in Mediterranean Revival, French Country Chateau or Provincial, English Manor/Tudor, or Contemporary Modern styles. See our Castles page here, and our new Contemporary/ Avant Garde portfolio here.